Melanie is Khallesi Mother of Dragons, Montie is is John Snow. 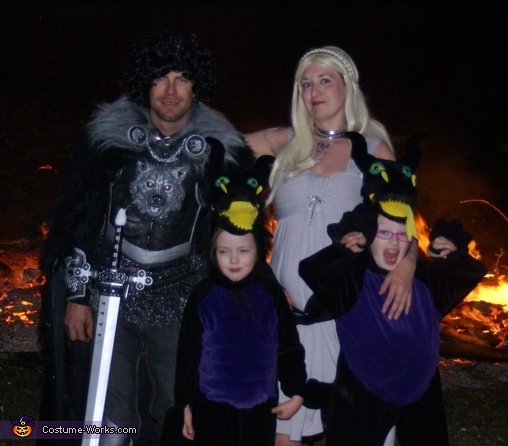 Both of our daughters wanted to be dragons for halloween so I was inspired to do these costumes. We do a theme every year. I took the pieces from a youth costume forJohn Snows breast plate and armour and painted them by handing, adding rhinestones to the eyes. I made John Snows Cape partly from a kids bedroom carpet. The chaims were baught at a dollar store and altered to look like metal leashes. I am a big Game of Thrones fan so this costume has been the most fun for me!